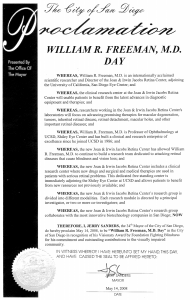 After more than 20 years of service to the San Diego community, William R. Freeman, M.D.,professor of ophthalmology at UC San Diego School of Medicine and Director of the UCSD Jacobs Retina Center adjacent to Shiley Eye Center, is being recognized by The Foundation Fighting Blindness as well as The City of San Diego. On Wednesday, May 14, 2008, the Foundation Fighting Blindness (FFB) will honor Freeman with the Visionary Award at their inaugural San Diego Dining in the Dark. The Visionary Award celebrates extraordinary people and professionals who support efforts to find treatments and cures for vision loss, as well as individuals who have made a profound impact on their community. Since coming to UC San Diego in 1986, Freeman has built a clinical and research enterprise of excellence known world-wide. 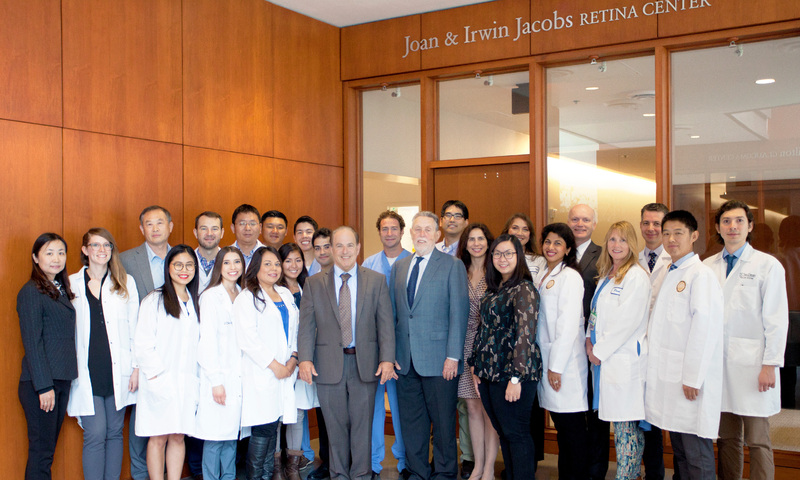 The new Joan and Irwin Jacobs Retina Center supports a research team dedicated to attacking retinal diseases that cause blindness and vision loss. The center houses projects seeking to find solutions for people of all ages who suffer from retina problems, which include debilitating disorders such as macular degeneration, diabetic retinopathy, tumors, and infectious and inherited diseases. Freeman is a prolific researcher and noted clinician and surgeon devoted to thwarting vision-threatening eye diseases. Freeman’s research focus has included using gene therapy to restore eyesight; use of artificial retinas; new drug therapies; and improving surgical techniques and technologies that allow a more accurate diagnosis and treatment. Freeman has published over 425 scientific papers, nearly 300 scientific abstracts, the highly regarded book Practical Atlas of Retinal Disease and Therapy, as well as numerous important medical chapters in the field of retina disease. He is listed among The Best Doctors in America, and serves on the editorial boards of many prestigious journals, including Retina, Ophthalmology, and the Journal of Uveitis and Ocular Inflamation. Freeman was also selected as the permanent President of the International Society of Ocular Infections. “Dr. Freeman has long been and will continue to be an important innovator and contributor to the world of retinal diseases. All of us at Shiley Eye Center are proud to be associated with him,” said Stuart Brown, M.D., professor and Chair of the UC San Diego Department of Ophthalmology, and director of the Shiley Eye Center. The inaugural San Diego Dining in the Dark event will be held Wednesday, May 14, 2008, at The US Grant, 326 Broadway, San Diego, CA 92101. Wine tasting and silent auction begin at 5:30 p.m. followed by dinner and awards at 7:00 p.m. Dining in the Dark is a unique sensory awareness experience that takes guests on a journey of tastes, sounds and touch, completely in the dark. Created in Germany, Dining in the Dark is a one-of-a-kind concept that has been enjoyed by many people across Europe and has been creating a buzz in the United States in recent years. Visually impaired servers will guide guests through an unforgettable dining experience that will allow participants to understand the darkness of daily life for those affected by blindness. Proceeds from this event will benefit more than nine million Americans who are losing their sight to degenerative retinal diseases such as age-related macular degeneration, retinitis pigmentosa, Usher syndrome, and other similar diseases.